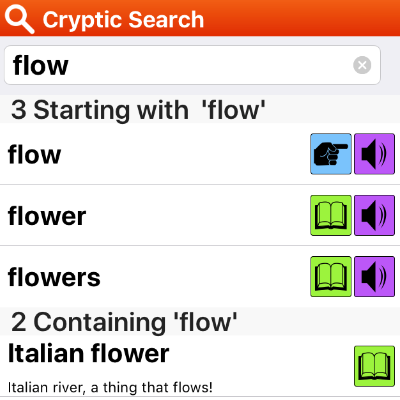 CrypticGuide is the one and only reference app for cryptic crossword devotees. It runs on iPhones, iPads, and iPod Touches. Do you need a helping hand now and then, when tackling cryptic crosswords? Have we got the app for you. Simply type a word or short phrase from a cryptic clue in, and the app will reveal possible cryptic meanings for that word. Uniquely, our cryptic dictionary also contains explanations for many of the weird and wonderful cryptic terms that are found in cryptic crosswords, so you will also find out why certain words are used! CrypticGuide also has an anagram solver, a hidden word search, and a wildcard search, to help you out of any tight corners. For the anagram, hidden word, and wildcard searches you can choose between the full word list, which includes proper nouns and short phrases, or the word game list, as used in games like Scrabble™. Please note that this is an inclusive app. We make no judgement about whether certain abbreviations, indicators, or cryptic definitions are 'unfair', Ximenean or non-Ximenean, too old, or too modern. We have tried to include as many possibilities that you might come across in the world of cryptic crosswords, by a whole range of setters (past and present), in a whole range of papers. So, if some of the entries make you raise your eyebrows (we certainly rose ours! ), please just smile in bemusement, and move on.